Apple CEO Tim Cook focused on iPad, Apple’s newest business during an opening segment of his “Let’s talk iPhone” talk at Apple’s Cupertino campus. “We think iPads can change the way teachers teach, and kids learn. Many educators agree with us. In fact, every state in the US, now has an iPad pilot program, or are deploying one,” he said while showing pretty slides depicting a range of different iPad users flashing happy smiles. The device has a 95 percent satisfaction rates, he stressed . More importantly, “kids are going to be amazing on those virtual keyboards when they grow up”. How true. And he wasn’t referring only to kids in the United States. And despite everybody and their brother trying to compete with iPad, 3 out of the 4 tablets sold in the US are iPads. Another unheard of number: 92% of the Fortune 500 companies are testing or deploying iPad. 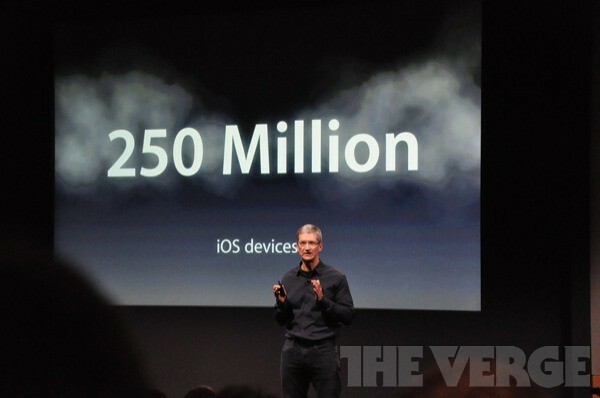 Last, but not the least, Apple has passed the quarter of a billion sales mark with iOS devices.